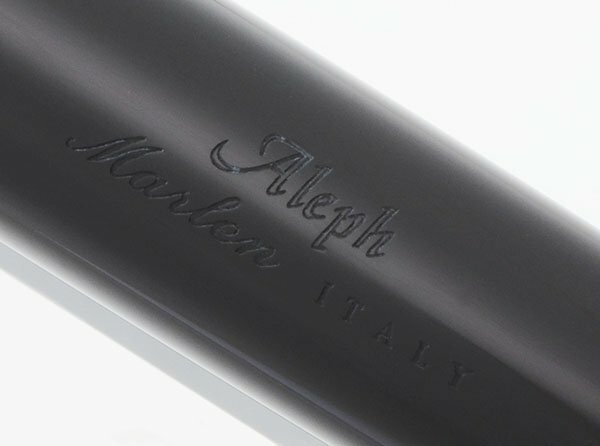 Marlen fountain pen from the Aleph series in black resin with chrome trim. 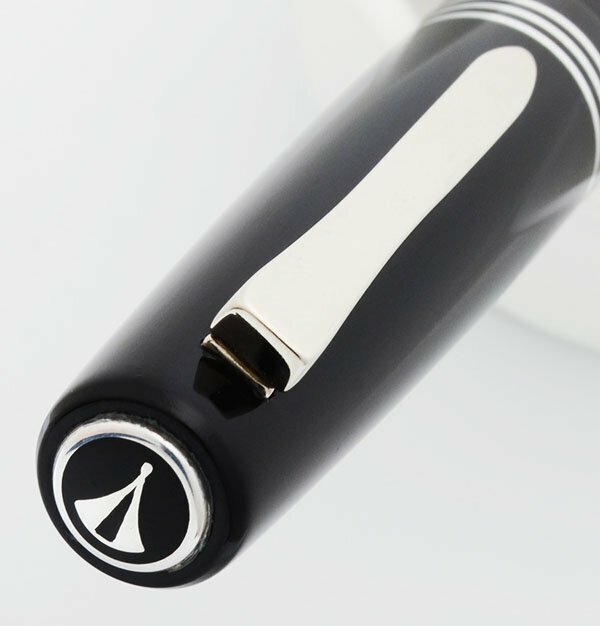 Semi-flexible stainless steel nib. Excellent + condition, in box, with paperwork. 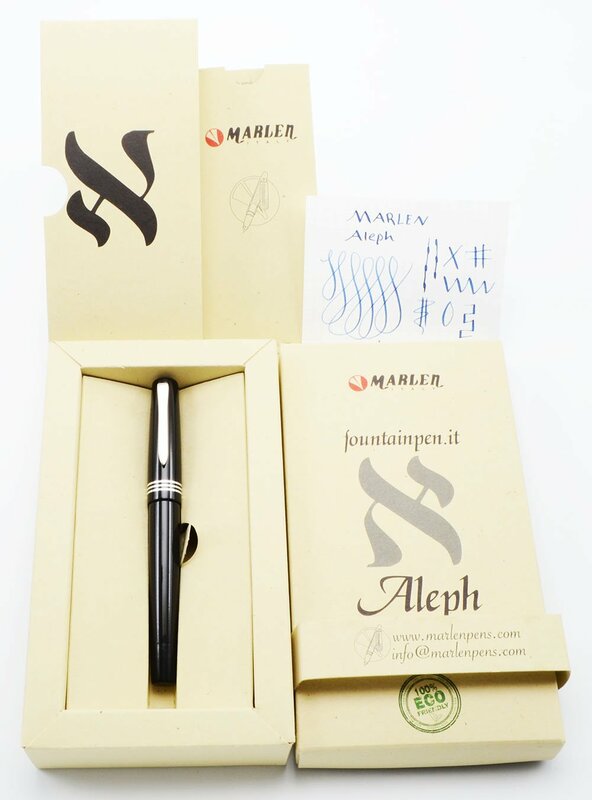 Product Name Aleph Series. 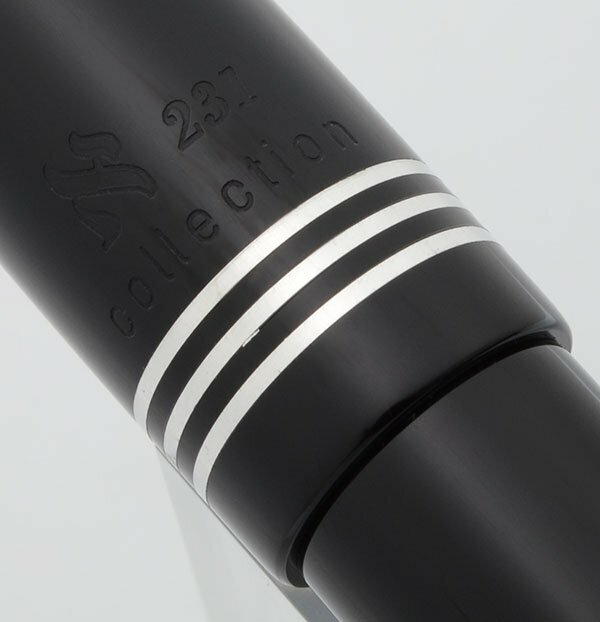 The pen is numbered 231 on the cap. Color Black resin with chrome trim. The cap at the end of the barrel seems to have some texturing on it. The cap band has three thin chrome rings. The Marlen logo is on the top of the cap. 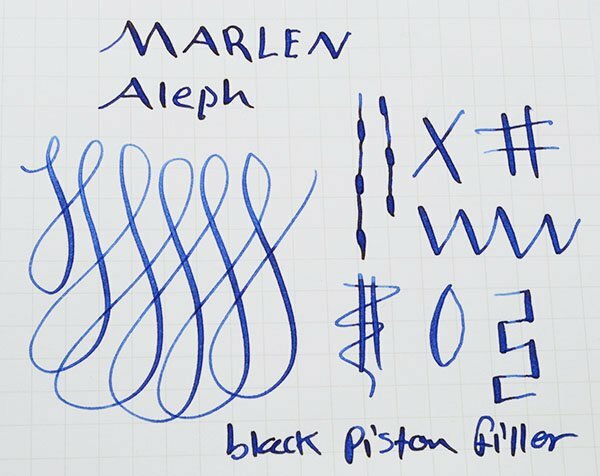 Nib Semi-flexible stainless steel nib (see writing sample, below). We judge it to be a medium. 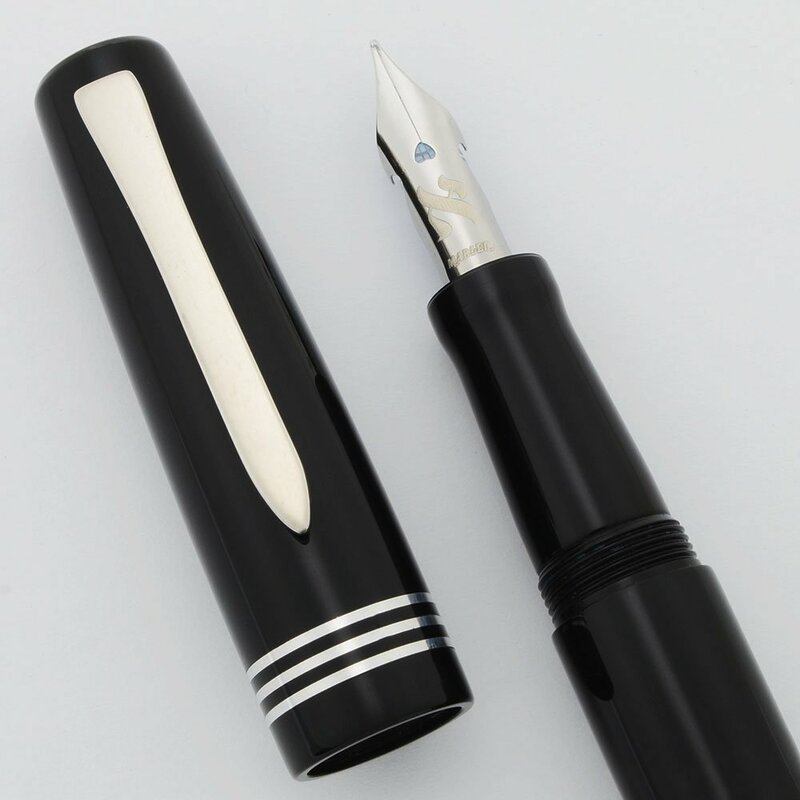 Condition Excellent + condition for this hefty, shiny, handsome pen that comes in its original cardboard eco-box that includes paperwork. The cap, barrel, and section all have light handwear and polishing marks throughout. There are no cracks, scratches, chips, dents, or personalization. The imprints are clear. Returns Policy: No questions asked, money back guarantee. If you have a problem with an item, we will replace/repair it, or refund your money, the choice is up to you. If you decide you don't like the nib after you've inked a new pen, we'll refund 75%. (There will be no such charge for a pen that is pre-owned, provided you return it in the condition received.) Of course, if it's a defect, we'll refund 100%. Payment Policy: Paying via Credit Card or PayPal are the only methods allowed for addresses outside the United States. Customers from the United States also have the option of sending a check, money order or cashier's check. Payment method is selected during checkout. Domestic US Shipping Policy: For the most part, shipping to US addresses is free and is made via first class mail. International Shipping Policy: International shipping is based on weight, and we give you a choice (depending on country) of first class, first class registered, priority mail or express delivery (only Express Mail provides true tracking). Internatonal shipments valued at over $40 come with free insurance, unless that service is not available for your specific country. Most of our customers opt for the very reasonably priced first class mail method, which can take anywhere from one to four weeks. We are happy to discuss alternatives to the options currently offered during the checkout process, so please contact us if you'd like a quote. Most countries charge customs fees on shipments from the United States, but this is not something we can estimate and there is no way to pay these fees in advance. It is the responsibility of the customer to anticipate these costs and pay them when they are assessed by your country or postal system. We have heard that shipments valued at 50 EU or more get assessed fees in EU countries, for example. UK customers please note: Packages valued at over $18 are subjected to both an administrative charge and a tax by UK customs and Royal Mail. Sorry, this is not something we can predict or pay in advance. Promo Codes and Coupons: You need to be registered and logged in in order to use one of our promo codes. They can each only be used once per customer. If you have problems getting a promo code to be accepted, sometimes it helps to log out and log back in again.